The Master of Science in Anesthesia Program at Case Western Reserve University is constantly adding clinical sites to our already impressive list of clinical affiliates nationwide. As the only MSA Program with a national reach, these affiliates allow students at all three locations to rotate throughout their region as well as nationally. 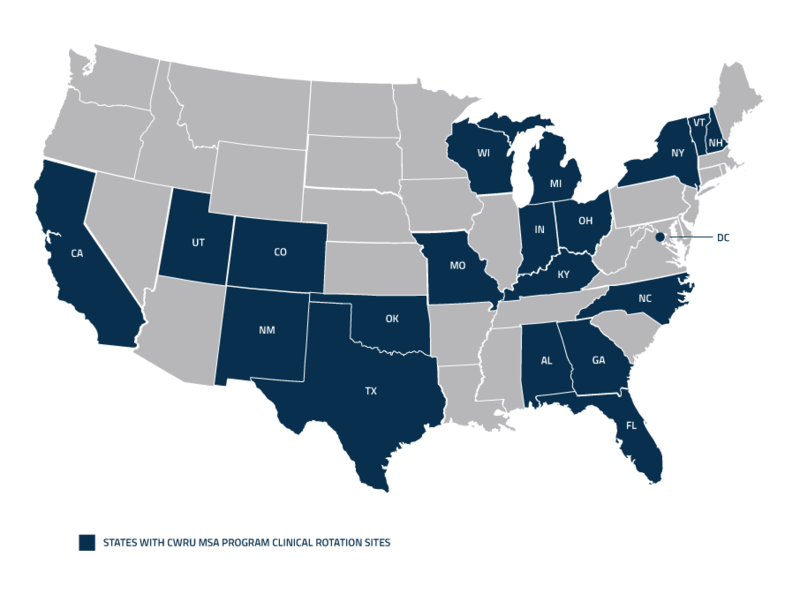 The map above illustrates states where the program currently maintains affiliation agreements. The sites include a wide range of hospitals, surgical centers and clinics in twenty jurisdictions throughout the continental United States. These clinical affiliates are valued partners, providing superior general and specialty training for CWRU MSA Program students and unique opportunities for learning, observing and networking. In the second year, students can request rotations at any of these locations. This opportunity allows for students to explore different settings and deepen their knowledge of specialties. Year after year, students report that these clinical rotations provide them with a unique level of preparation. They see higher acuity cases, are able to test their skills in emergency situations and grow increasingly confident in the operating room. Through these experiences, students are also able to network with potential employers and find the hospital and anesthesia care team that’s the right fit for them after graduation. Many students leave these clinical rotations with invaluable experience and connections—and, often, with job offers.